Let’s face it, listening to presentations is the most boring thing ever. Some people just go on and on and on about stuff that we already know or don’t really care. And the presentation slides (which are supposed to keep our concentration on the presentation topic) are so infested with boring texts that it’s more fun looking at the spider on the wall. And that’s when we start thinking about the important things of life (“What’s that under my nail?”). Even 10 minutes of the presentation seems like an eternity. But once in a while, someone comes up and wows us with everything in the presentation, starting from the way he/she talks to the way the presentation slides are made…everything! It feels like listening to a story and seeing it unfold in front of our eyes at the same time. We just want to take everything in. And when the presentation finally ends, we start wondering how that person has done it. The process is very simple really. And it’s explained in the basic 7-Step Guide that we have prepared so that you too can be “that guy/girl”. Step- 1: Know your audience. The first and foremost thing that you need to worry about before giving a presentation is who will be in the receiving end of it. Everything else depends on it. If it’s for professional, old-school people then you can’t really use whacky colors in your presentation slides. If you have to present in front of students then you have to make the presentation as engaging as possible, even put in some funny jokes if you can. Whereas if you are pitching a business plan then it’s probably a good idea to be as direct with your presentation as you can. Otherwise, you lose your audience within the first minute. Whatever you say on the podium has to have goals behind it. You need to be sure what you are trying to achieve. If it’s just a class presentation then your goal is to impress the teacher as well as the classmates. If it’s presentation on a project proposal in a business that you have prepared then the goal is a little bit more complex. Then your goal can be not only to impress the boss with flashy ideas but also to get approval for the project by stating the feasibility. Always remember to set a S.M.A.R.T. goal (Specific, Measurable, Achievable, Realistic, Time-Driven). Step-3: Craft a compelling message. Make the audience relate to what you are saying. Keep in mind that the audience have to find something in the presentation that can benefit them. Even if it’s a class lecture, the students would want to learn new things in a way that is more engaging. And they won’t just believe everything you say. So, try to prove the credibility of whatever point you make. 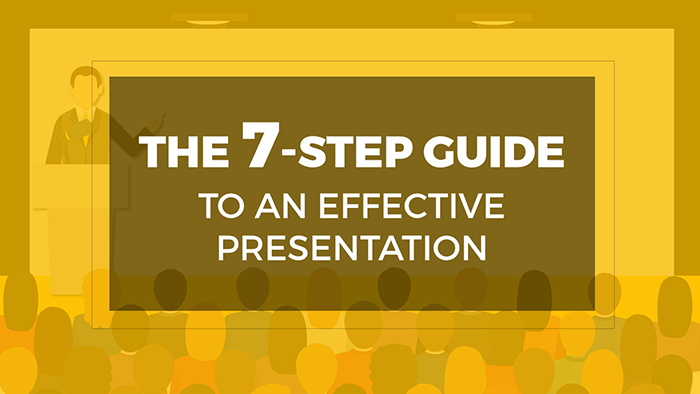 Also, keep the presentation as simple and as less vague as possible. It’s a good idea to create a presentation structure before creating the presentation slides or the speech. Every presentation should have Introduction, Main Body and Takeaways. The introduction should be compelling enough so that the audience decide to listen to the main body. DO NOT put too much information on each slide of the main body. That causes the audience to lose interest. And finally, the takeaways should have just the result, outcome or decision that you have found or made from the main body. This is the part that most people will remember. So, be as specific as you can. Building a theme is not as easy as it sounds. Choosing colors for your presentation slides is very crucial. You don’t want to be too generic, but you don’t want to be too crazy either. Always try to pick a few colors and be consistent throughout all the slides. Choose a color combination that is easy on the eye. The font is also important. Childish, generic fonts will just ruin your whole presentation. The fonts should be consistent as well. And always see if everything ties up with the type of presentation that you are going to give and/or the company you are representing or not. Remember, audience remember visuals more than words. So, always try to put graphs, charts, numbers, shapes and also images in the slides to show what you are trying to say. But be creative about it. Avoid using stock images if you can. Change the design of graphs and charts if possible. And also, don’t put too many things in one slide. It becomes hard for the audience to take in everything. Step- 7: Hook your audience. Always be conversational and engaging in your presentation. The whole point of a presentation is to get everyone’s attention and tell them some idea or some information. So, don’t tell unnecessary things. Keep it short and to-the-point. But also try to trigger emotions of the audience. This makes the audience want to listen more to what you have to say. If you want to create awareness about water pollution through your presentation then may be tell a heart-clenching story of what water pollution can do to you. This is just an example. You can use many other methods. But the most important thing you have to think about during a presentation is if it will be beneficial to the audience or not. If your presentation ticks all these criteria then you are good to go. How Do Investors Evaluate a Pitch?